Get your Arcadia POA Pink Patch Today! The Arcadia Police Department has partnered with Zero Breast Cancer of San Rafael. 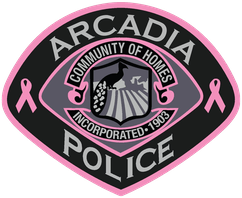 As part of this initiative, the Arcadia Police Department is selling their pink patches directly to the community for $10 each.